Dark Terror. Convert from 110 to 220 volts. How?! I want to buy Dark Terror on eBay, but in my contry voltage is 220. How to convert 110 volts to 220? I find how make Tiny Terror to 220 volts. If I do the same thing with Dark Terror, then will it work with 220 volts? Re: Dark Terror. Convert from 110 to 220 volts. How?! 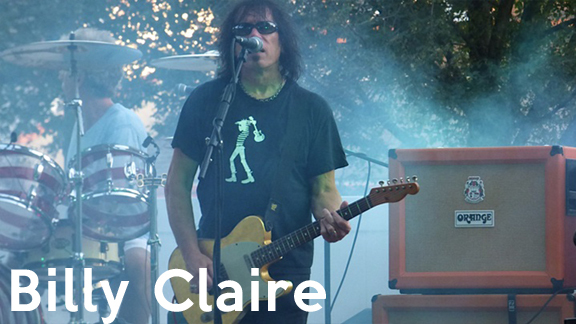 We have no techs to repair tube amps Russia... what more can I say. Buy in England... hm, there are no england amps on eBay, and no shipping in england stores to my country. Last edited by Sooner on Thu May 15, 2014 12:35 pm, edited 1 time in total. Dark Terror and Tiny Terror use the same power transformers, right? 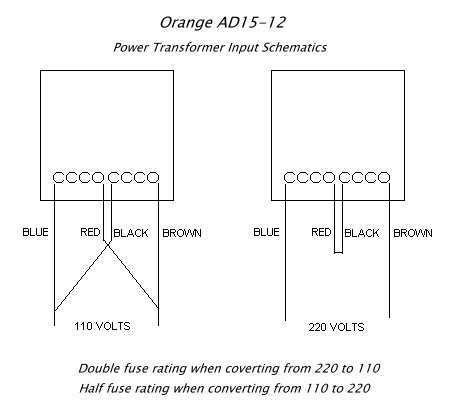 Don't know if they're exactly the same but as far as I know all Orange tube amps since the AD15 (late 90's) can be converted between 120 and 240 volts and the color coding for the transformer wiring is the same. They are the same) I've cheked it. 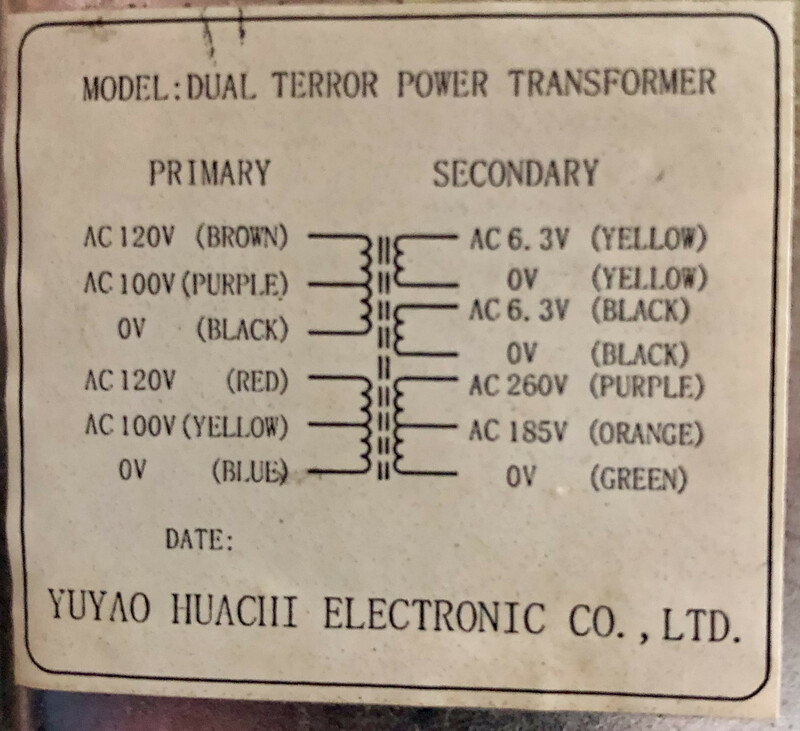 I am searching for the opposite... Got a Dual Terror that is a 220v and I need to convert it to 127v. Should I start a new thread or should we keep it here? Last edited by rvelozo on Wed Jan 30, 2019 12:34 pm, edited 1 time in total. 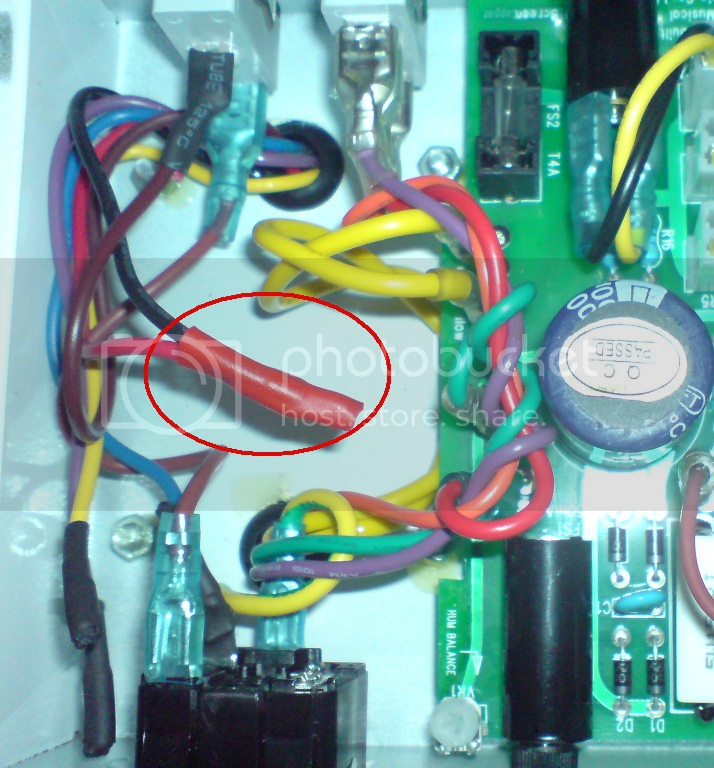 You can convert it from 220 to 110v by removing the black and red wires from the main power input jack inside the chassis and connecting them together. It should look like this when you're done: (You need to double the mains fuse rating too). Thank you! But joining red and black would match the 220 configuration, wouldn't it? Sorry. You're correct. Yours will already have the red and black connected together. You nee to separate those and connect the black with the blue, and red with the brown. Thank you for your help. I was able to change it. Will leave it here for future reference. This is how it was set to 220v. Black and Red connected. Interesting. 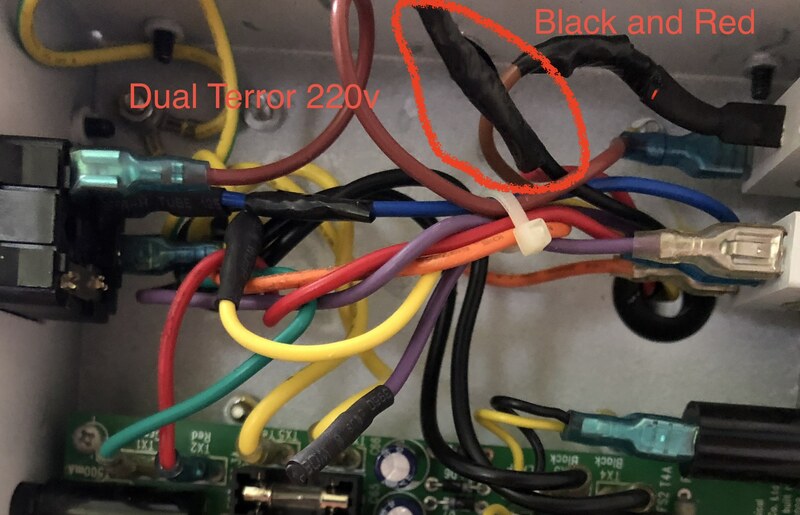 Judging from the use of electrical tape before you made the change, it looks like your amp was originally wired for 110v and had been converted to 220v before you acquired it? FWIW I would suggest replacing the electrical tape with heat shrink. Over time electrical tape tends to deteriorate. Thanks for the advice on the electrical tape! Will replace that. 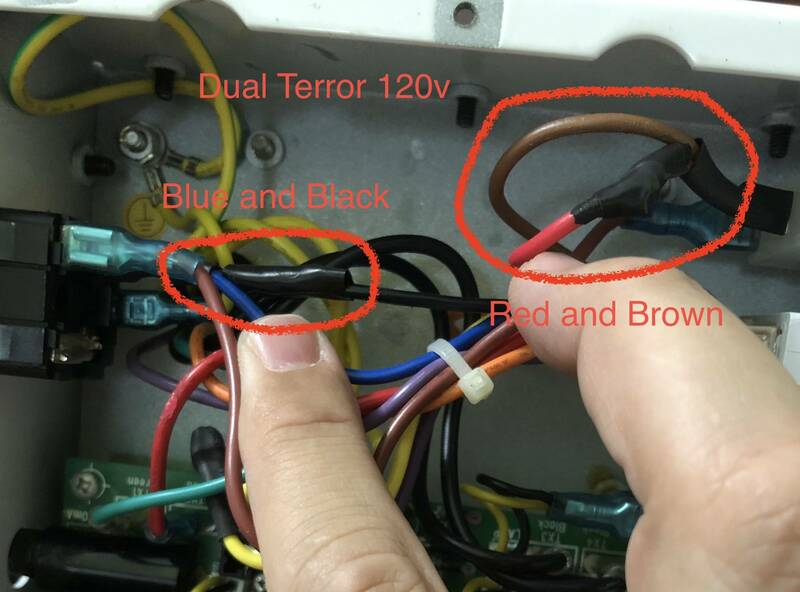 I was surprised to find out that the short stubs of the red and black wires cut and had been tapped along the blue and brown wires. That proves that it had been converted before. Which explains what happened when I got the amp. The 120v is marked on the chassis and the seller told me that the amp was in fact 220v. I asked him about the difference between the label and the actual voltage... he didn't know. This is in Brazil where most of the states use 120v and a few use 220v. The guy that sold it to me is from a state south of mine where it's 220v. The dealer he bought it from converted it to sell in that state. He had it changed and forgot about it... or simply lied about it. Although I don't understand what that would do for him. Although I tested it successfully, now I need to get the T2A fuse, since I blew the T1A after a few minutes as expected. Maybe my next project will be replacing a crackling gain pot on the TT channel. It is not too bad now. Last edited by rvelozo on Mon Feb 04, 2019 6:28 pm, edited 1 time in total.